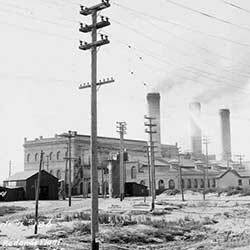 SCVHistory.com | History (& Preshistory) of Southern California Edison, 1886-2013. Edison International is the parent company of Southern California Edison (SCE), a regulated utility, and Edison Energy, a non-regulated energy services company. While SCE was officially incorporated in 1909, the company was originally formed by the mergers and acquisitions of many small predecessor companies going back to 1886. Due to the short duration of patents at the time, Thomas Edison allowed electric utilities to use his patents if they used his name. This is why there are many utilities which include the name "Edison" but are not affiliated with each other. 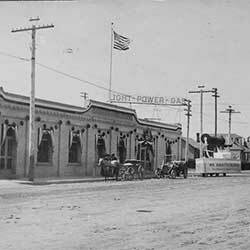 1886: Lighting up the town of Visalia, Calif.
Edison International traces its origins back to July 4, 1886. On that day, the partnership of Holt and Knupp (which later became the Visalia Electric Light and Gas Company) first used a steam engine fueled by cord wood to power brilliant arc lights during Visalia's evening 4th of July celebrations. Later that same year, the Santa Barbara Electric Light Company was formed and quickly installed brilliant outdoor arc lights to illuminate the balmy resort evenings in downtown Santa Barbara. Both the Visalia and Santa Barbara companies would later be merged into the Southern California Edison Company in the early 1900s. 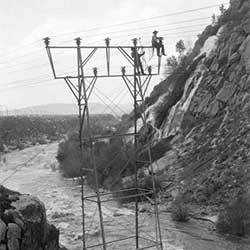 1887: Hydroelectric power near Riverside, Calif. In 1887, the first commercial hydroelectric plant in the West was built at the community of Highgrove near the City of Riverside. The plant took advantage of a 50-foot water drop in an irrigation canal to turn three waterwheels and direct current dynamos. The electricity was transmitted a very short distance to illuminate 30 arc lights in Riverside and Colton. In 1888, the company was incorporated as the San Bernardino Electric Company and later acquired by Southern California Edison in the early 1900s. 1888: Steam-powered street lights in Pasadena, Calif. In 1888, the Pasadena Electric Light and Power Company installed steam-driven direct current generators to power arc lights for street lighting in Pasadena. Likewise, in 1890, the Ventura Land and Power Company installed hydroelectric generation to power arc lights in downtown Ventura, thereby catching up with their Santa Barbara neighbor further up the coast. In 1891, local businessman Henry Sinclair and Dr. Cyrus G. Baldwin, the first president of Pomona College, co-founded the San Antonio Light and Power Company. Their goal was to provide electric street lighting to the city of Pomona. The technical challenge they faced was that direct current power could not be practically transmitted long distances. Fortuitously, Baldwin hired A.W. Decker, a creative young engineer familiar with the cutting edge of advances being made with alternating current. 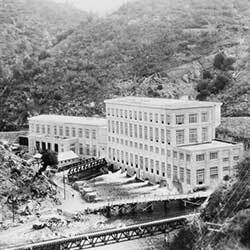 Decker installed the first single-phase alternating current hydroelectric generator in San Antonio Canyon above Claremont. 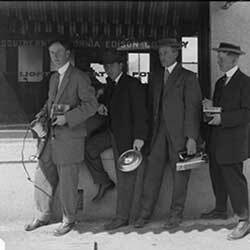 In late 1892, power was transmitted 14 miles to Pomona and, one month later, 29 miles to San Bernardino. The age of long-distance transmission had begun, thereby opening access to remote hydroelectric resources. Most history texts consider the Niagara Falls to Buffalo, New York transmission line as the first long-distance electric line in the nation built in 1896, but the reality is that Decker did it four years earlier in San Antonio Canyon. A bronze plaque marks the spot on Mt. Baldy Road. In 1892, Henry Sinclair formed the Redlands Electric Light and Power Company to provide power to the Union Ice Company for the new electric motors in its ice-making facility in Mentone. The closest hydroelectric resource was eight miles away at Mill Creek. This long distance would require high-voltage alternating current. The creative young engineer A.C. Decker recommended that an innovative three-phase alternating current generator be installed to do the job. This new three-phase system enabled electric motors to start and stop independently of the generator and delivered a smoother power torque to the rotating equipment. It was the first commercial power plant using three-phase alternating current to be installed in the U.S. Today, three-phase power generation remains the standard for power generation worldwide. Although the original equipment was upgraded in 1934, the Mill Creek plant remains in operation today as the oldest active poly-phase power plant in the U.S. In 1894, the recently constructed Mill Creek hydroelectric plant powered electric pumps installed to irrigate many of the orange groves in Redlands. This was the earliest recorded use of electric pumps for irrigation purposes. In 1895, The Kaweah Power and Water Company was formed to survey the potential development of hydroelectric facilities on the Kaweah River above Visalia and Tulare County. The Kaweah Hydro Plant began operating in 1899 and its operations were folded into the larger Mount Whitney Power Company. Eventually, Mount Whitney Power would be sold to Henry Huntington in 1916 and would be merged into SCE when Huntington sold his power business to SCE in 1917. In 1896, the population of Los Angeles was approaching 100,000. Although it was served by several power companies, the city had a growing need for electricity. 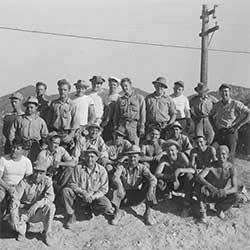 Several Los Angeles businessmen launched the Westside Lighting Company. The first president of the company was George Barker, one of the famous Barker Brothers of local furniture store fame. Westside Lighting is the most important of Edison's ancestral companies. It would eventually adopt the regional name Southern California Edison and would consolidate together the numerous local power companies that today comprise the Southern California Edison Company. To eliminate the growing overhead clutter of power, telegraph, and telephone lines in downtown Los Angeles, the City Council adopted an undergrounding ordinance in 1897. To meet the challenge of undergrounding its lines, Westside Lighting adopted Thomas Edison's patented three-wire conduit technology used in most eastern cities. The Edison General Electric Company required that local electric companies using Edison patents incorporate the use of the Edison name within their own corporate name. 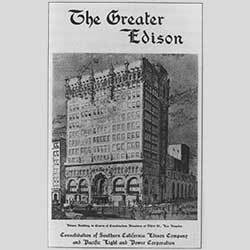 Therefore, Westside Lighting changed its name to the Edison Electric Company of Los Angeles. Throughout the early development of the U.S. electric power industry, many local companies incorporated the name "Edison" with their corporate names (e.g., Consolidated Edison, Commonwealth Edison, Boston Edison, etc.). Despite the commonality of the Edison name, all of these companies remained totally independent corporations. In 1896, Henry Sinclair of the Redlands Electric Light and Power Company teamed up with Henry Fisher, a prominent Redlands resident, to form the Southern California Power Company to pursue the construction of a new hydroelectric facility on the Santa Ana River. Thirsty for more power supplies for downtown Los Angeles, the Edison Electric Company purchased Sinclair's Southern California Power Company in 1898 and constructed a 83-mile high-voltage transmission line to bring the power into downtown Los Angeles. At the time, this was by far the longest and highest voltage transmission line built anywhere in the country. Edison engineer Orville Ensign designed "the Redlands" insulator for use on this line. This innovative insulator design was rapidly adopted throughout the West. 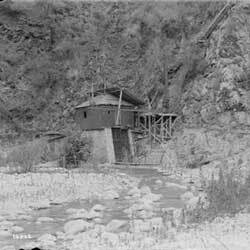 In 1897, the San Gabriel Electric Company was formed to construct a hydroelectric facility on the San Gabriel River in Azusa Canyon. The Azusa Hydro Plant began transmitting power into Los Angeles along a 23-mile transmission line in 1899. This power plant would soon be a linchpin in supplying power to the electric trolley car dynasty of Henry E. Huntington. 1901: Our motto: "Good Service, Square Dealing, and Courteous Treatment"
In 1901, John Barnes Miller became president of the Edison Electric Company. He had joined Westside Lighting as its General Manger in 1897. 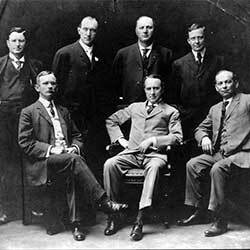 Miller coined the Company motto that survives to this day: "Good Service, Square Dealing, and Courteous Treatment." Known as "the Great Amalgamator," he recognized that lower costs could be achieved by expanding the scale of the company through mergers and acquisitions. 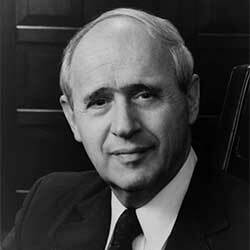 Miller headed the Company for 31 years, presiding over the most expansive period in its history. He died in 1932. 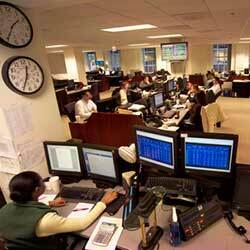 To date, he has been the longest serving chief executive officer of the Company. Henry E. Huntington was by far the most famous of Edison's ancestral executives. Huntington was the nephew of Collis P. Huntington, one of the four founders of the Southern Pacific Railroad. Henry came to work for his uncle in San Francisco in 1892. 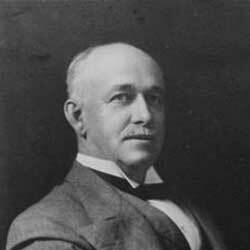 In 1898, he purchased the Los Angeles Railway known popularly as the "Yellow car" system. 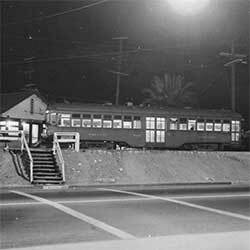 In 1902, Huntington formed the Pacific Electric Railway that would eventually become the sprawling interurban electric trolley system known as "the Red Car." To assure adequate power for his trolleys, Huntington created the Pacific Light and Power Company, which immediately absorbed the San Gabriel Electric Company and its hydroelectric facilities in Azusa and San Antonio Canyons. Over the next 15 years, Huntington's Pacific Light and Power Company developed in parallel with, and in competition with, the Southern California Edison Company until Huntington sold PL&P to Edison in 1917. 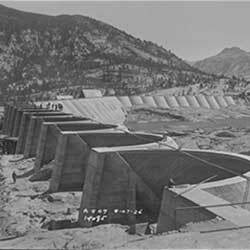 Beginning as early as 1894, John Eastwood had explored and developed hydroelectric resources in various parts of the Sierra Nevada mountains. 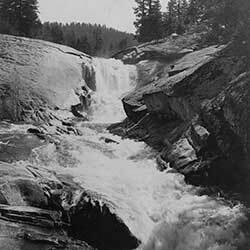 By 1903, Eastwood had completed an exploration of the hydroelectric potential in the area of Shaver and Huntington Lakes. Eastwood discovered a precipitous watercourse he named "Big Creek" which spewed huge amounts of water thousands of feet down into the San Joaquin River in late summer. In his quest for electricity to power his growing trolley empire, Henry Huntington would eventually pour massive financial resources into developing Big Creek beginning in 1910. 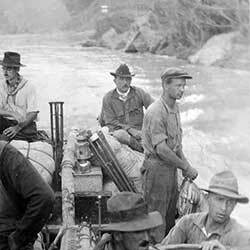 1904: Investing in the Kern River Co. In his quest to develop adequate sources of cheap hydroelectricity to power his trolley systems, Henry Huntington purchased the Kern River Company in 1902. 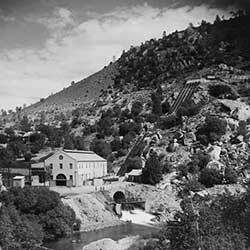 The company had been leisurely developing a hydroelectric facility on the Kern River since 1897. Huntington hastened this development and the Borel Hydro Plant on the Kern River began operations in 1904. 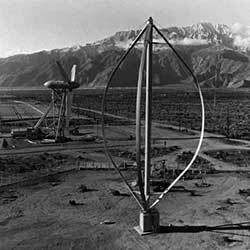 The power was transmitted over a 127-mile high-voltage line. It was the most remote source of electricity serving Los Angeles at the time. 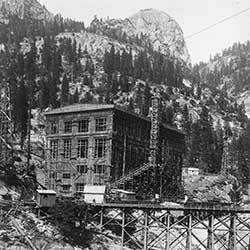 Nevada Power, Mining and Milling Company's hydroelectric plant constructed on Bishop Creek in the Eastern Sierras begins to operating to supply the Nevada gold-rush towns of Goldfield and Tonopah. 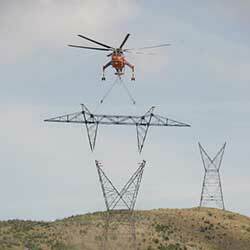 This required the construction of a 113-mile transmission line crossing a pass at 10,500 feet over the White Mountains. The Nevada Power, Mining and Milling Company would eventually become part of the California electric Power Company which merged into SCE in 1964. 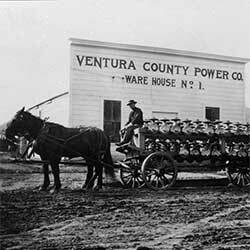 In 1906, the Ventura County Power Company was incorporated and acquired the electricity systems in Ventura, Oxnard, and Santa Paula. Ventura County Power Company was also in the gas business in Ventura, Oxnard, Hueneme and Santa Paula. With access to the oil and gas resources in Ventura County, the Company was able to provide the first natural gas service in Southern California. 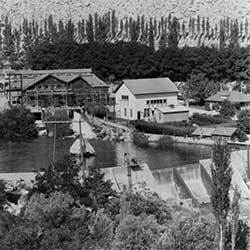 In 1907, Edison Electric began producing power from its newly constructed Kern River Hydro Power House. 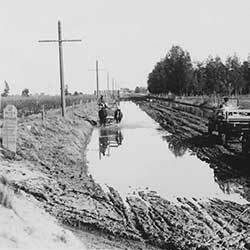 To deliver this power to the Los Angeles basin, Edison built a 118-mile, 75 kilovolt transmission line, the highest voltage in the nation at the time. This line was also the first to be built on steel towers. Although Henry Huntington's main preoccupation was his system of trolleys and the electric facilities to power them, he was also the founder of the Southern California Gas Company. In 1908 he purchased two small gas companies and in 1910 incorporated them into his Pacific Light & Power Company as the Southern California Gas Company. After Huntington purchased the gas systems serving the cities of Riverside and San Bernardino, SoCal Gas was well on its way to becoming the regional gas utility. However, in 1912, Huntington sold Southern California Gas in order to bolster his finances for the successful completion of the hydroelectric Big Creek Project in the southern Sierras. 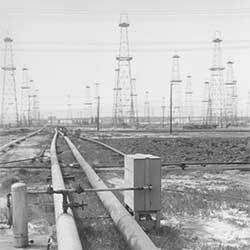 Between 1912 and 1921, Southern California Edison also sold all of its gas utility properties to SoCal Gas. With its rapidly expanding regional footprint, the Edison Electric Company was reincorporated as the Southern California Edison Company — the name it retains today. Acting on John Eastwood's earlier discovery of the massive hydroelectric potential at Big Creek, Henry Huntington begins developing what was formally known as the "San Joaquin River Hydroelectric Project." This was the largest privately financed hydroelectric project in the nation at the time. The project would be a showcase of cutting-edge technological feats: the biggest hydro generators, the strongest pipes, and the highest heads of water. With the gold-rush economy in the Eastern Sierras rapidly declining, the Southern Sierras Power Company undertakes a bold effort to survive by sending its power to markets in the Los Angeles basin. It constructs a 238-mile long transmission line — then the world's longest — across the Mohave Desert, through the Cajon Pass, and into the San Bernardino Valley. The following year, Southern Sierras power expanded its service into the cities of Perris, Hemet, Rialto, Corona, Elsinore, and others. 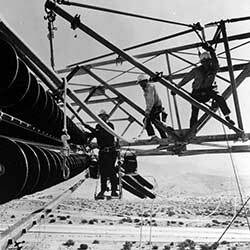 Based on their extensive experience with water projects such as the Owens Valley Aqueduct Project, the Los Angeles water Department was becoming more and more interested in extending its operations into hydroelectric generation and local electricity distribution. In 1912, the Los Angeles City Council voted to begin negotiations to purchase the local electric facilities of SCE, Pacific Light and power, and L.A. Gas and Electric. 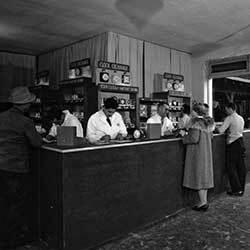 SCE eventually sold its facilities to the City of Los Angeles over a period of protracted negotiations spanning from 1922 to 1937. Fortuitously for SCE, its loss of business in Los Angeles was quickly offset by the suburban growth throughout the LA basin. Construction of Big Creek Power House #1 is completed. To transport its power down to the Los Angeles basin, Henry Huntington builds the longest and highest voltage transmission line in the world - 243 miles and 150Kv. 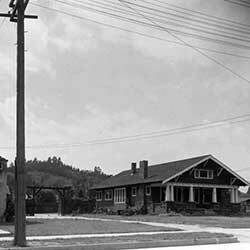 In 1913, power began flowing to the Eagle Rock Substation. Over the subsequent years, large amounts of additional storage and hydro capacity were added at Big Creek. The tightly integrated system of dams and generation would become known as "The Hardest Working Water in the World." 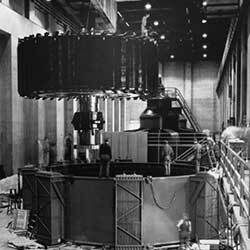 By 1929, the system provided more than half of SCE's generation capacity. Through the early 1950s, Big Creek would provide a major portion of the electricity consumed in Southern California. With power finally flowing from his Big Creek Project, Henry Huntington had extra power to sell and Ventura County was in bad need of a reliable power supply. A new transmission line was built from Pacific Light & Power's san Fernando substation to connect with Ventura County and improve the reliability of the power supply distributed by the Ventura County Power Company. Throughout the early 1900s, utilities played a key role in promoting the use of the new household appliances that were intimately identified with "modernity" at the time. Many of these appliances enabled a social revolution, which freed women to spend less time on household chores. During the coming decades, more and more women steadily would enter the conventional workforce. Beginning around 1916, the Southern Sierras Power Company quickly consolidated the many small power systems operating throughout the agriculturally important Imperial and Coachella Valleys. Electricity was especially important for irrigation pumping and ice making. With Big Creek well on its way to successful development and a power supply assured for his trolley empire, Henry Huntington turns his attention toward retirement and devoting more time to his collection of rare books and fine art eventually housed at the Huntington Library in Pasadena. 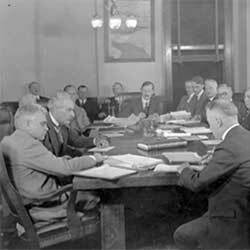 In 1917, Huntington sells Pacific Light & Power to Southern California Edison and becomes a member of SCE's Board of Directors. Construction of the Redondo Steam Plant is finshed. The city of Pasadena condemned SCE's property within the city and purchased the SCE system at a price determined by the California Public Utilities Commission. As early as 1902, SCE had expressed interest in developing dam sites at Walapai Wash and Boulder Canyon on the Colorado River. In 1921, SCE had four 18-foot kayaks built and, in partnership with the U.S. Geological Survey, began a survey of 800 miles of the Colorado River from Green River, Utah to Needles, California to determine the best location for hydroelectric dams. These explorations would eventually lead to the construction of Boulder Dam, later known as Hoover Dam. 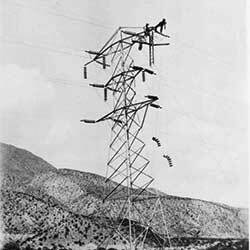 With more and more generation coming on line at Big Creek, the capacity of the original transmission line to Los Angeles was becoming inadequate. To create more transmission capacity the voltage on the line was raised to 220 kilovolts. 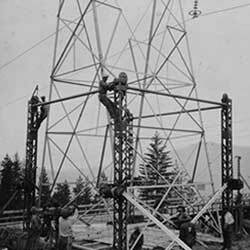 Longer insulators had to be installed requiring the height of the towers to be raised. 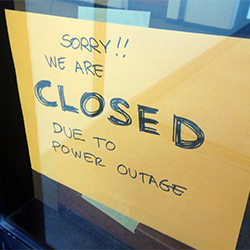 Because of the importance of the power supply the line could not be taken out of service. The changeover had to be accomplished while the line was still "hot." As a result of this technological accomplishment, SCE became the first recipient of the Charles A. Coffin Medal, today known as the Thomas A Edison award. 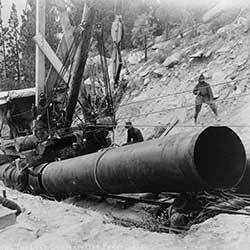 Completion of Big Creek required boring the Florence Lake Water Tunnel to deliver water from Florence Lake to Huntington Lake through 11 miles of granite. When completed, it was the longest tunnel in the world. To speed its construction new explosives were introduced as well as new hard-rock drilling equipment and techniques. Along the way the crews established a new hard-rock drilling record of 692 feet in one month. The project was completed two years ahead of schedule. 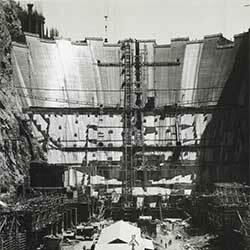 SCE completed Florence Lake Dam, the largest multiple-arch dam in the world at the time. The special design of the dam reduced the amount of concrete carried up into the mountains. Costs were further reduced by using the granite waste from the Florence Tunnel as concrete aggregate, and cannibalizing the tracks of the temporary Florence Tunnel railroad to provide steel reinforcement bars. 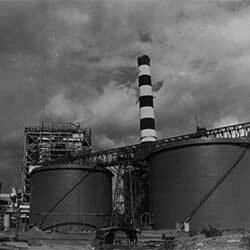 The great construction effort at Big Creek in the 1920s was capped by the completion of Big Creek Plant No.2A. It was the highest-head hydro plant in the world, with portions of its steel penstock having to be contracted out to various manufacturers in the United States, Germany, and Poland. 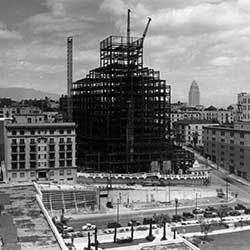 Construction begins on SCE's new headquarters building at 5th and Grand in downtown Los Angeles. The building was designed in accordance with state-of-the-art seismic calculations to withstand a severe earthquake. The lobby contains a magnificent array of four murals by prominent artists typical of the grand "art deco" era in downtown Los Angeles. The office opened its doors in 1931. To support the construction of Hoover Dam, SCE, Southern Sierras Power, and the Los Angeles Department of Water and Power signed a contractual commitment to find a market for a large share of the power that would be produced by Hoover Dam. The contract also provided that SCE would operate the generation facilities at Hoover on behalf of investor-owned utilities and LADWP would operate the facilities on behalf of the publicly owned utilities. A separate contract provided that Southern Sierra would supply all needed power to the site during construction of the dam. For this purpose, Southern Sierra crews constructed a transmission line from San Bernardino to the Hoover site in just 225 days. In 1931, the U.S. Bureau of Reclamation awarded construction contracts to build Hoover Dam to six large companies. The project was huge, amounting to one-twelfth of the federal budget in 1931. 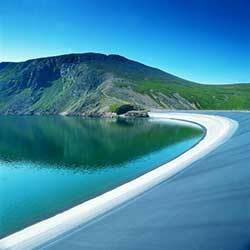 The dam would create the world's largest man-made lake at the time, trapping two years of river flow. 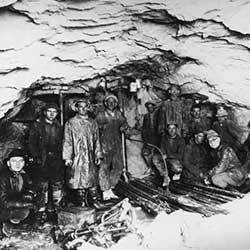 Many of the engineers, hard-rock miners, and other workers employed on the project were veterans of the Big Creek Project, which wound down in 1929. 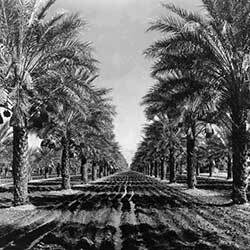 The Imperial Irrigation District had been formed in 1906 to organize irrigation investments to serve local farmers. In 1935, IID decided to branch into electricity service and secure a low-interest loan from the Rural Electrification Administration to develop power generation and distribution facilities. There ensued a contentious competition between IID and Southern Sierra Power Company to provide electricity service to the Imperial Valley farmers. Late in 1943, Southern Sierra capitulated and sold its local facilities to IID. 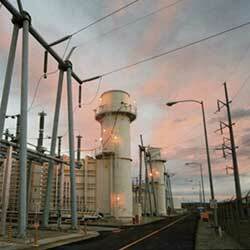 Supplying adequate power to local industry in the rapidly growing Los Angeles area was a challenge. 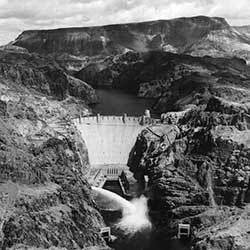 In 1939, SCE began receiving its share of power from Hoover Dam across a 220 kilovolt transmission line that had just been completed. For all of its efforts on the Colorado River, in the end Edison was awarded only about 5% of the output of Hoover Dam. 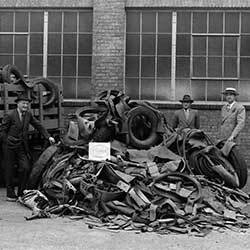 At the outbreak of World War II, Edison headed many drives to collect scrap rubber, copper, cast iron, steel, brass, and other materials for the war effort. 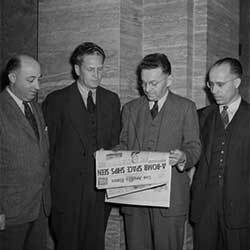 Shown here are four of the five SCE engineers quietly ordered to report to the University of California's Radiation Laboratory at Berkeley to work on the Manhattan Project to develop nuclear weapons. These five engineers helped design the electrical system for the Oak Ridge, Tennessee, plutonium extraction facility. For this and other wartime activities, SCE was awarded the Charles A. Coffin Award and the National Security Award. Altogether, 899 SCE employees served in the armed forces during WWII. 13 lost their lives. 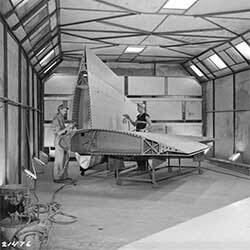 The war provided a major boost to southern California's leadership position in aircraft and later aerospace. By the middle of the century, a nationwide standard for electricity finally emerged — current alternating at 60 cycles per second. 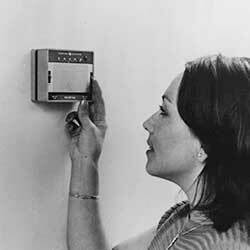 In 1946, SCE switched its 50-cycle system to a 60-cycle system to conform with this standard. This required a massive rewiring of virtually all appliances containing motors. Shown here is SCE's clock exchange program. Nearly 2 million customer appliances of all sorts needed adjustments. It was a massive logistical effort that took three years to complete. During the war, many veterans from the east and Midwest became familiar with southern California's very favorable climate and economic opportunities. This led to tremendous population growth during the post-war period. Much of Edison's expanding workforce would be filled by these war veterans. As the use of automobiles expanded, periodic episodes of severe photochemical smog became a regular health and aesthetic problem in the LA basin. With its several power plants along the coast, SCE was one of the many potential causes implicated in the smog problem. To assure that good public policy would be based on sound science, SCE funded Dr. A.J. Haagen-Smit, a Caltech engineer, to conduct full-scale research on the nature and chemical origins of the LA smog. 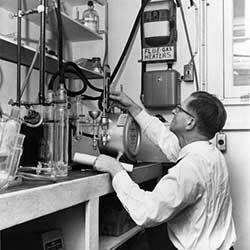 Haagen-Smit's research quickly became world famous. With the assistance of SCE engineers, Haagen-Smit developed several new pollution control technologies for power plants. 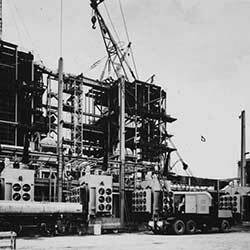 In 1957, SCE became the first investor-owned utility in the U.S. to generate electricity commercially from a nuclear reactor. The 7.5 megawatt Santa Susana Experimental Nuclear Station was located in the Santa Susanna Mountains above Moorpark. With the population of southern California booming, especially in Orange County, SCE scrambled to keep up with the growing power demand by constructing new power plants. 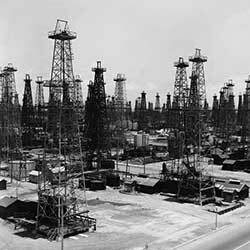 From 1945 to 1970, SCE would build 10 new gas- and oil-fired steam plants along the coast. 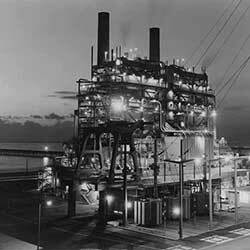 One of these was the Huntington Beach Steam Plant that began operations in 1958. SCE continued to wring still more power from the "hardest working water in the world" at Big Creek. 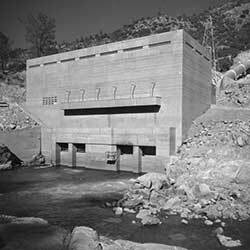 Between 1947 and 1960, SCE built more hydro facilities that doubled the capacity of Big Creek. In 1961, the last of Henry Huntington's Red Car line — on Ocean Blvd. in Long Beach — ceased operating. It would be years before passenger rail transportation would return again to the Los Angeles basin with the Metrolink system in 1992. In 1962, SCE purchased the aging electric, gas, and water systems on Catalina Island off the Los Angeles coast. SCE would later install a modern seawater desalination plant at the Pebbly Beach Generating Station to supplement the meager supplies of freshwater on the island. In 1964, California Electric Power Company (CalElectric) merged with SCE. Although the CalElectric system was much smaller, it had a huge and rapidly growing service area in the counties of Riverside, San Bernardino, and Inyo. 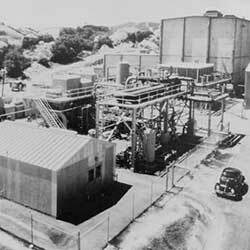 SCE built a generating station at El Segundo in 1954. 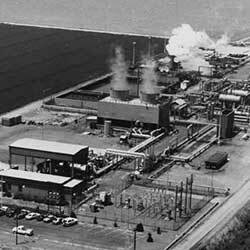 In 1965, a modernized and expanded El Segundo Steam Plant began operations. 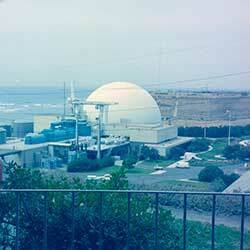 In 1968, SCE completed construction of its 450 megawatt San Onofre Nuclear Generating Station Unit 1. This facility was the first significant commercial nuclear generation plant to go into operations west of the Rockies. This plant would operate for 25 years before shutting down in 1992. SCE, Pacific Gas and Electric, San Diego Gas and Electric, and Los Angeles Department of Water and Power built the Pacific AC-DC Intertie between 1967 and 1970. The Intertie system consists of two 500-kilovolt AC lines and one 500-kilovolt DC line. The DC line was the first major high-voltage DC line constructed in the U.S. With subsequent expansion this system of AC and DC lines is capable of transporting almost 8,000 megawatts of power. 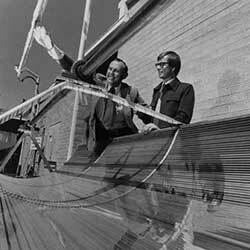 In 1970, in anticipation of rising fossil fuel prices and environmental concerns about traditional power generation technologies, SCE launched a Research, Development, and Demonstration Department to gain hands-on experience with cutting-edge renewable technologies such as wind and solar generation as well as "alternative" generation technologies such as nuclear power and coal gasification. 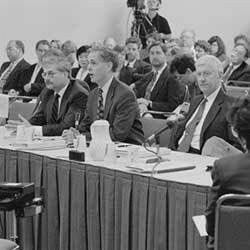 Throughout the 1970s and 1980s, SCE's RD&D department worked on many projects in conjunction with the newly formed Electric Power Research Institute in Palo Alto and the Energy research and development Administration of the U.S. Department of Energy. 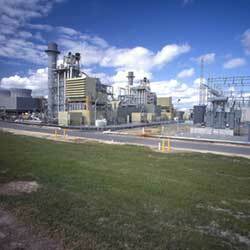 Mohave Generating Plant began operations in 1971. The coal was delivered by the world's first coal slurry pipeline stretching 275 miles from the Black Mesa Mine on the Navajo and Hopi Reservations in Arizona to the location of the Mohave plant in Laughlin, Nevada. 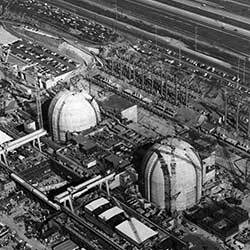 In 1972, SCE broke ground for the construction of San Onofre Nuclear Generation Stations Unit 2 and 3. 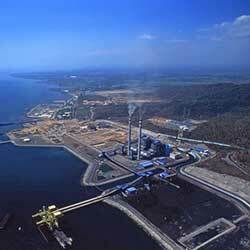 These 2,200 megawatt plants would take over a decade to complete. In response to environmental concerns and the high fossil fuel prices following the Arab Oil Embargo of 1973, SCE ceased its efforts to market more electricity and initiated customer conservation programs to encourage its customers to use electricity more efficiently. SCE established a Wind Energy Research Center near Palm Springs, California, to assess the potential for wind power generation using various alternative technological designs. SCE CEO William R. Gould announces a major corporate initiative to develop 2,000 megawatts of new alternative and renewable power generation during the coming decade. 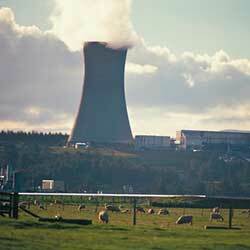 These technologies included wind, solar, geothermal, fuel cells, hydroelectricity, and combined heat and power. One year later, SCE is the first corporation ever to win the John and Alice Tyler Ecology-Energy Award. In 1978, SCE and Union Oil agreed to design, construct and operate a 10-megawatt geothermal power plant at Brawley, near the Salton Sea. This plant began operating in 1981. In conjunction with the DoE, and the Los Angeles Department of Water and Power, SCE built Solar 1, a thermal solar plant, near Daggett in the Mojave Desert. Solar 1 began operating in 1982. 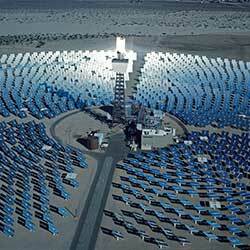 A second venture, Solar 2, began operations in 1996. Texaco sought a partnership with SCE to co-develop a combined heat and power plant near Bakersfield. Texaco would use the steam for enhanced oil recovery and the power would be purchased by SCE in accordance with the recently passed federal Public Utility Regulatory Policies Act. To partner with Texaco on this Kern River Cogeneration Project, Edison launched a new subsidiary later known as Edison Mission Energy. 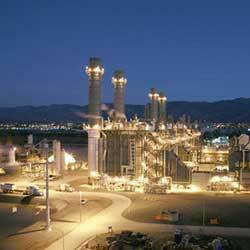 SCE began operations of the Cool Water Coal Gasification Project near Barstow, California. The Cool Water Project was the first demonstration of a commercial-scale integrated gasification combined cycle (IGCC) power plant. Today, many hope that IGCC technology can be used in conjunction with carbon capture and sequestration to enable native U.S. coal to be burned while reducing greenhouse gas emissions. 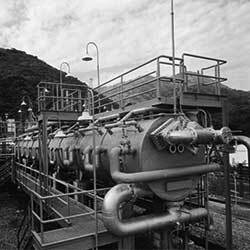 Cool Water was a joint project of SCE, Texaco, EPRI, GE, Bechtel, and a Japanese research body. Edison's inaugural venture into the "independent power generation" business, the Kern River Cogeneration Project, began operating in 1985. Edison Mission Energy and Texaco would quickly develop several more combined heat and power plants in the Bakersfield area: the Sycamore, Midway, and Sunset projects. 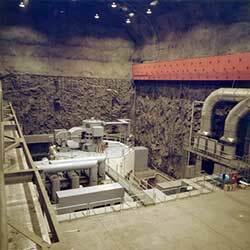 The last expansion of Big Creek was completed as the Balsam Meadow (John S. Eastwood) Pumped Storage Project began operations. Like the rest of the facilities at Big Creek, it is an engineering wonder. To build the facility, SCE crews bored a 5,900 foot diversion tunnel from Huntington Lake, a 4,320 foot power tunnel, and a 7,500 foot trailrace tunnel. The generation plant itself sits in a huge room hewn inside a mountain of granite. To take full advantage of the emerging competition in the electric power industry, Southern California Edison reorganizes its corporate structure. 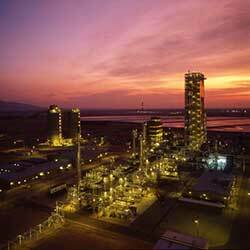 A holding company, SCEcorp, will now hold two separate subsidiaries: SCE and The Mission Group. SCE will continue to be a regulated regional utility while The Mission Group will hold unregulated entities such as Edison Mission Energy. SCEcorp will later be renamed Edison International. 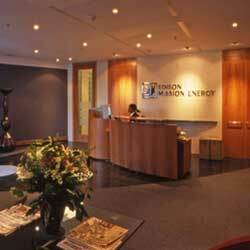 Edison Mission Energy opened its first international office in London. The location was selected to establish a foothold in the newly privatized energy market in the United Kingdom and to provide a launching point into European electricity markets in the expectation that they would soon become open to independent generation development. SCE's proposed merger with San Diego Gas and Electric fails approval by CPUC. Edison Mission Energy began operations of Kwinana Cogeneration and Loy Yang B in Australia as a result of Australia's power industry privatization. California Public Utilities Commission adopts retail competition model referred to as "Retail Wheeling." Edison Mission Energy acquires First Hydro Dinorwig pumped storage station in Wales, UK. SCEcorp is renamed Edison International. 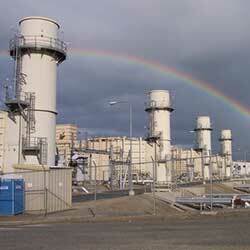 SCE divests all its gas-fired steam plants as a result of CPUC's retail competition ruling. Edison Mission Energy began operations of the Paiton Project in Indonesia, acquired Contact Energy in New Zealand, Fiddler's Ferry and Ferrybridge plants in England, plants in the Chicago area that comprised Midwest Generation, and Homer City in Pennsylvania. Edison Mission Energy acquired the marketing and trading operations of Citizen's Power in Boston which became known as Edison Mission Marketing and Trading. The California energy crisis began. Independent power trading begins driving costs upwards rapidly. Both SCE and Pacific Gas and Electric became insolvent in the first quarter of the year. On April 6, PG&E declared bankruptcy and Edison International stock price fell precipitously. 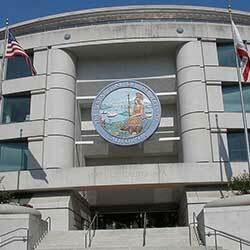 In October, SCE negotiates a settlement for financial recovery with the California Public Utility Commission. 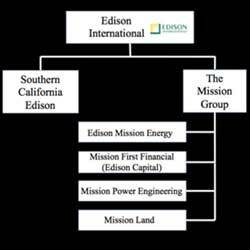 The independent power producer industry implodes due to a combination of overcapacity and over-leveraging, resulting in sales of nearly all of Edison Mission Energy's international assets. 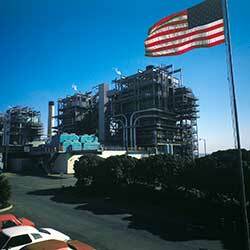 In response to the collapse of the independent power industry in the state, SCE purchased an unfinished gas-fired plant in Redlands, California and quickly got the Mountainview plant online to relieve power shortages in the area. 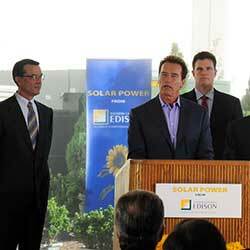 California Governor Schwarzenegger established a goal of 3,000 MW of solar power on residential rooftops. 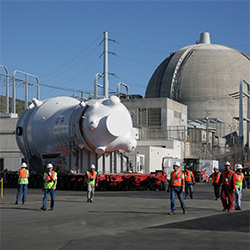 SCE initiates replacement of steam generators for San Onofre Generating Station Units 1 and 2 to extend the useful life of the plant for the benefit of customers. 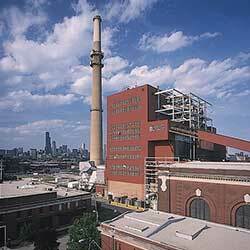 Edison Mission Energy's Midwest Generation enters into a comprehensive settlement with Illinois EPA to reduce greenhouse gas emissions from its fleet of coal-burning plants in the Chicago area. 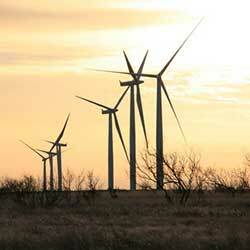 Edison Mission Energy diversifies into wind generation in Iowa and Texas, eventually building sites in 14 states. SCE begins construction of the Tehachapi Renewable Transmission Project, the first transmission line in the nation built specifically to carry renewable power. 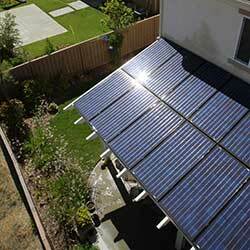 SCE launches the industry-leading Solar Photovoltaic Rooftop Program. 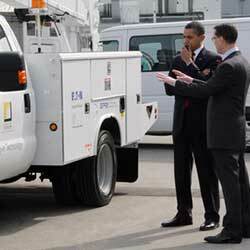 Newly-elected president Barack Obama visits SCE's Electric Vehicle Technical Center in Pomona and delivers an energy policy speech, praises SCE's innovation and leadership in electric vehicle research. 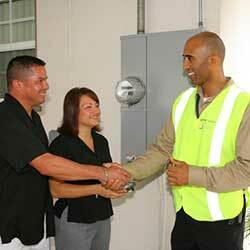 On September 14th, SCE installed first "Smart Meter" in Downey, California. Eventually over 5 million meters were replaced. 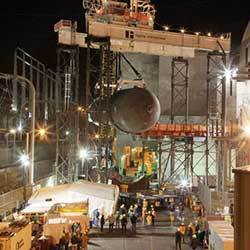 New Steam Generators at the San Onofre Nuclear Generating Station begin operations. In August, Edison Mission Energy's Midwest Generation subsidiary announced the decision to close both the Fisk and Crawford Generating Stations in Chicago. In December, Midwest Generation filed for Chapter 11 bankruptcy protection. 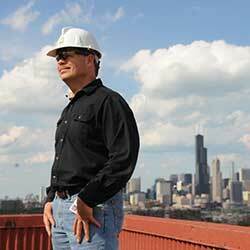 In August Edison International announced the purchase of SoCore Energy, a commercial solar company based in Chicago. 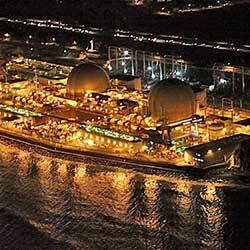 SCE announced retirement of the San Onofre Nuclear Generating Station in June. SoCore is not the same company as Southern California Edison, the utility, and SoCore is not regulated by the California Public Utilities Commission.